TECHNICAL DETAILS: Bootstrap HTML landing pages and WordPress site for continued updates. BuddyCRM are a new player in a crowded software market so they required a web presence that could compete with the big boys but that didn’t break the bank. The site was launched in two phases, an initial single page landing site with ‘coming soon’ banner to attract interest and help create a buzz around Buddy. The second phase involved evolving the site into a scrolling website with sections on key features and pages which expand on the benefits to core users of the software, signup forms, plus connections to a support site and blog. It’s a site that houses a lot of information so designing a layout that made it all feel simple and accessible was the Awemous challenge here, keeping the visuals simple and clean with clear navigation and strong calls to action were the order of the day. We’ve since updated the entire site to WordPress for continued content updates. Keeping a website fresh and interesting is key to maintaining the interest of recurring visitors and ensuring search engines consider the site active. 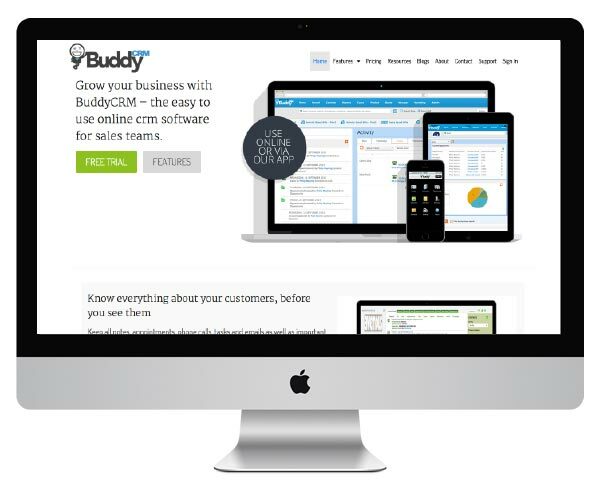 BuddyCRM is an all new online sales CRM system designed for sales teams of 5 or more. With BuddyCRM you have access to all the company information held on your clients wherever you are. The CRM app gives management the reporting facilities they need, the marketer the opportunity to contact clients and prospects regularly with targeted campaigns and the sales person complete history on previous contact with the company.